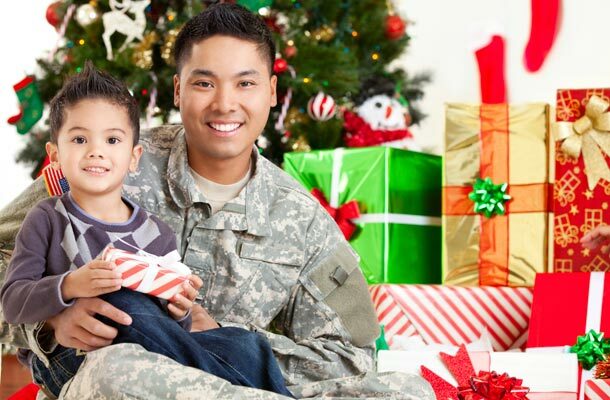 What do deployed troops really want to find in their care packages this holiday season? It turns out, some of the most appreciated gifts are practical items like these. Powdered drink mixes. These are beverages that can be prepared with water—cocoa, instant coffee, tea bags, creamer, iced tea, lemonade and other powdered drink mixes such as Gatorade or Crystal Lite. Entree enhancers. The idea is to make military meals and MREs tastier by adding enhancers like ramen noodles, seasoned salt, spice mixes, and individual packets of honey, mustard, relish, ketchup, and hot sauce such as Taco Bell or Tabasco. Instant protein. Favorites include energy bars, tuna in pouches, sunflower seeds, nuts, canned chicken, SPAM, and non-perishable beef jerky. Snack packs. Send small, hard containers instead of bags that burst under high pressure. Popular salty snacks like chips, pretzels and nuts are good for those deployed in the desert. Also look for favorite brands of snack cakes, crackers (such as Goldfish), trail mix, caramel corn, dried fruit, and cookies. Candy and gum. Send gum and candy in zip-lock bags in case they may become gooey in transit. Include hard candy and avoid chocolate; it melts in warm climates. Also send extra for sharing—especially if your service member comes in contact with local children. Travel-size personal care items. Avoid aerosol cans. Keep liquids from making a mess by first covering container openings with plastic wrap, then recapping. Ship these items in zip lock bags separate from edibles. Popular items include toothpaste, body wash, shampoo, conditioner (for female soldiers in particular), disposable razors, shaving lotion, eye drops, lip balm, lotion, moleskin, foot powder (Gold Bond is a favorite), pain relieving topical creams, baby wipes, sunscreen, and disposable hand warmers for cold climates. Reading materials. Paperback books, magazines, comic books, a copy of your local newspaper. Music. Send an iPod loaded with favorite music or CDs if your service member has a CD player. Batteries. AA and D batteries are in biggest demand. If you’re sending a battery-operated device such as a CD player, remove the batteries so it can’t accidentally turn on in transit. Games and puzzles. Crossword puzzle and word search books, Sudoku books, jigsaw puzzles, foam footballs, Frisbees, Hacky Sacks, playing cards, yo-yos, and travel-size board games. Prepaid phone cards. Look for the best deals on overseas minutes or buy here. Writing essentials. A small notebook, stationery, note paper, envelopes, pens, pencils and stamps. Reminders of home. There’s no better gift than a personal note, family photos, children’s drawings, even homemade cookies or brownies packed in an airtight container. Gift certificates. Buy a gift certificate here that’s good at any military Exchange in the world. What not to send. There may be items you can’t send, depending on where your service member is located. For example, if he or she is in the Middle East or Persian Gulf areas, don’t send anything that would offend people of the Islamic faith. Check with a military Key Volunteer, Ombudsman, or command family support group contact for details.